For the weapons of our warfare are not carnal.. but mighty through God to the pulling down of satanic holds. 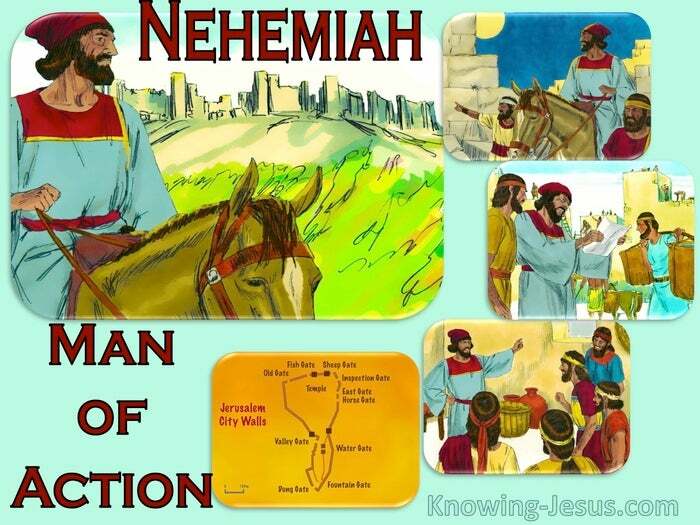 Nehemiah was a man that lamented that the walls of Jerusalem were broken down. He wept and grieved in deep anguish for the devastated ruins of his once great home – and for days he prayed in travail of spirit over the condition of the city of Zion, but Nehemiah began to repair the broken walls and fallen bulwarks of God’s city. How often we see the physical conflicts of Israel – translate into our spiritual battles. The Church is in a similar, sorry state of disrepair – as gospel truths become distorted. Like Nehemiah – Christians should be building our own spiritual wall of protection. In the physical realm Nehemiah built-up Jerusalem’s broken walls with stones. In the spiritual sphere Christians should build a rampart with our intercessions. Nehemiah’s literal wall-building mirrors our own fortification of “All-Prayer” Israel’s literal weapons of warfare parallel our own spiritual weapons of Eph. 6. Nehemiah was distressed by the shocking state of disrepair of God’s beloved city and we should be pained by disunity in the Church in these increasingly dark days. Nehemiah built a material wall to safeguard the city – chosen and beloved of God, and we should build a spiritual wall of protection – around Christ’s beloved bride. The physical weapons of Israel were metal swords and spears and helmets. The spiritual armour for the Church is Christ – all we need is found in Him. We need to be undergirded with His truth and remain covered in His righteousness. We should minister the gospel of peace and have trust His word implicitly – as fact. We should take the helmet of salvation and the believers’ sword which is God’s Word. We should be watchful and alert – praying on all occasions for the body of Christ. We need to consciously put-on Christ each day – and throughout the day. 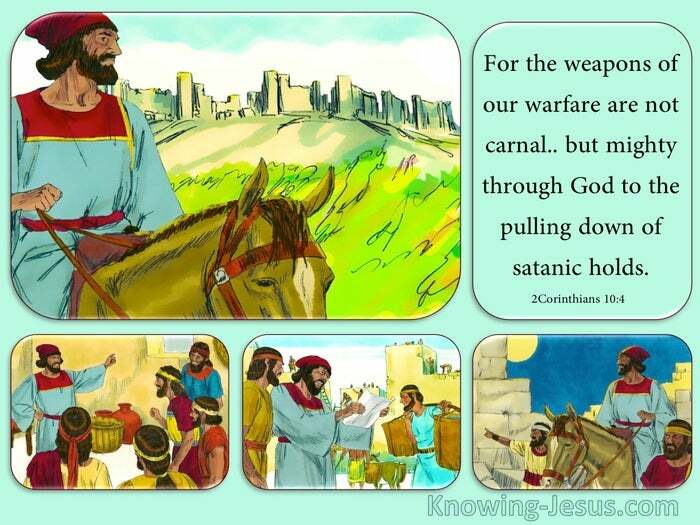 For the weapons of our warfare are not carnal.. but mighty through God to the pulling down of satanic strongholds. 2Corinthians.10:4 The physical weapons for Israel were against wicked, earthly antagonists. The spiritual weapons for the Church are against satanic, heavenly principalities. The believers weapons in this age – involve the putting on of Christ – DAILY. The Christian armoury – involves girding ourselves with Christ – each day. We are to dress in truth; righteousness; peace; faith; salvation and the Word of God, and we are to be praying always with All-Prayer and supplication in the Spirit. Israel was exhorted to trust in the Lord and obey (literally hear / keep) His word – the literal meaning of obey is to hear – we are to hear and obey God’s Word. Nehemiah was a man that lamented that the walls of Jerusalem were broken down. He wept and grieved in deep anguish for the devastated ruins of the once great city, and Nehemiah prayed in travail of spirit over the condition of the city of Zion – and then he finally set about rebuilding the broken walls of the city of God. Likewise, we need to lament over the deteriorating state of the church of God. We should grieve and lift up our voice in prayer and supplication for Christ’s body. When Nehemiah built the fallen city wall his weapon of war was in his hand. The labourers carried on their work with one hand supporting their load and with the other hand the held on to their weapon, and each of the builders wore his sword at his side as he worked. Nehemiah 4:17. Intercession for the Church, which is Christ’s body begins in anguish of heart, but like Nehemiah we need to pray – and work with our sword in our hand: for our weapons of war are mighty through God to pull down satanic strongholds. So, be strong in the Lord and in his mighty power. Put on the full armour of God, so that you can take your stand against the devil’s schemes. For our struggle is not against flesh and blood, but against the rulers, against the authorities, against the powers of this dark world and against the spiritual forces of evil in the heavenly realms. Therefore, put on the full armour of God, so that when the day of evil comes, you may be able to stand your ground, and after you have done everything, to stand. Stand firm then, with the belt of truth buckled around your waist, with the breastplate of righteousness in place, and with your feet fitted with the readiness that comes from the gospel of peace. In addition to all this, take up the shield of faith, with which you can extinguish all the flaming arrows of the evil one. Take the helmet of salvation and the sword of the Spirit, which is the word of God – and pray – pray in the Spirit on all occasions with all kinds of prayers, and keep on praying for all the Lord’s people.